India has been a host to some of the most exotic and skillfully crafted jewelleries that reflects its textured heritage and culture. And no occasion is complete without these splendid fineries that mark the onset of the most cherished times. Indian women have an eye for tasteful ornaments that enhance their grand ensembles, exude an air of feminine mystery and add a unique, poetic and sublime touch to their aura. 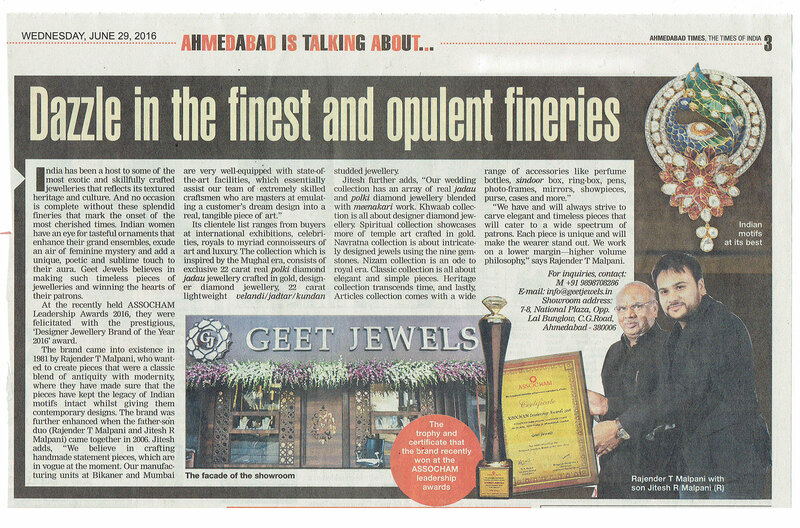 Geet Jewels believes in making such timeless pieces of jewelleries and winning the hearts of their patrons. 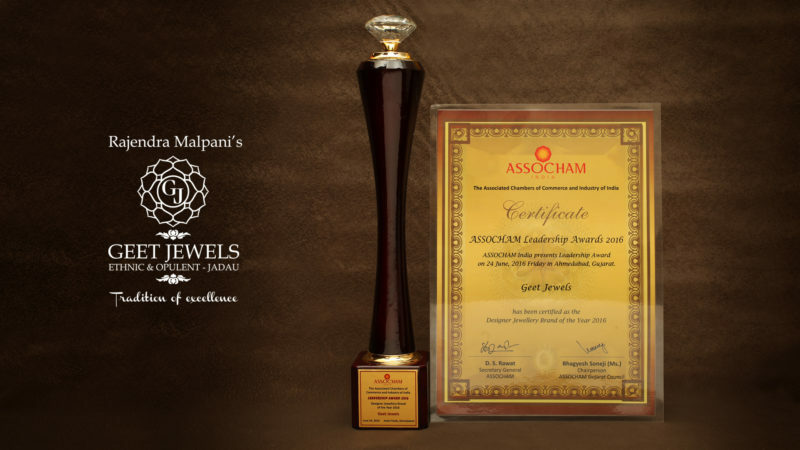 At the recently held ASSOCHAM Leadership Awards 2016, they were felicitated with the prestigious, `Designer Jewellery Brand of the Year 2016′ award. Its clientele list ranges from buyers at international exhibitions, celebrities, royals to myriad connoisseurs of art and luxury . The collection which is inspired by the Mughal era, consists of exclusive 22 carat real polki diamond jadau jewellery crafted in gold, designer diamond jewellery, 22 carat lightweight velandijadtarkundan studded jewellery. “We have and will always strive to carve elegant and timeless pieces that will cater to a wide spectrum of patrons. Each piece is unique and will make the wearer stand out. We work on a lower margin–higher volume philosophy ,“ says Rajender T Malpani. For inquiries, contact: M +91 9898708286 E-mail: info@geetjewels.in Showroom address: 7-8, National Plaza, Opp. Lal Bunglow, C.G.Road, Ahmedabad 380 006.